Every time there is a major leak of offshore documents, Ukrainian President Petro Poroshenko seems to get caught in another discrepancy regarding his plans for Roshen, his candy company. The latest leak, the Paradise Papers, gives the most detailed view to date of Poroshenko’s true intentions for the troubled restructuring of his confectionary empire. During his election campaign, Poroshenko publicly promised to sell his business if elected. But just days afterwards, his lawyers were asking a legal services firm to set up a structure that would allow him to move his company offshore, evade Ukrainian taxes, and stash money abroad. Citing the risks of associating with him, the firm eventually declined to deal with Poroshenko. He ended up setting up a similar offshore structure with a different, less wary firm. A separate financial filing discovered by reporters raises questions about whether Poroshenko’s claims not to have moved any Ukrainian cash to his offshore holdings are true. The story started shortly after Poroshenko’s election in May 2014. Riding the euphoria of the victorious citizens’ revolution against the corruption-ridden former government earlier that year, Poroshenko vowed to tackle the grand corruption that had fueled the uprising in the first place. The problem is that, as the owner of Roshen, the country’s leading confectionary business, Poroshenko was himself a well-known magnate. He promised to focus on government and sell the company to prevent any conflict of interest. To that end, the new president hired Avellum, a law firm, and ICU, an investment firm. Poroshenko took on the anti-corruption crusade with zeal, denouncing the use of offshore companies to evade Ukrainian taxes. As the Ukrainian currency plummeted in the wake of a war with Russian-backed separatists, the national bank slapped currency controls on businesses to keep money from fleeing the country. All seemed fine until April 2016, when the Panama Papers bombshell exploded. Working from millions of documents provided by the International Consortium of Investigative Journalists (ICIJ) and the German newspaper Süddeutsche Zeitung, reporters for the Organized Crime and Corruption Reporting Project (OCCRP) revealed that, in fact, there was no trust controlling his companies. Instead, Poroshenko’s Cyprus lawyers, Dr. K. Chrysostomides & Co, had hired the Panamanian company Mossack Fonseca to set up a complex offshore structure run by a British Virgin Islands (BVI) company, Prime Assets Partners Limited, that remained under his control. Poroshenko’s response was to acknowledge the offshore structure while insisting that it had been created in preparation for being handed over to a trust. He would eventually set up the trust the same month. However, the latest leaks show that Poroshenko’s earliest plans were very different from the story he was telling journalists. The new Paradise Papers files come from the Bermuda headquarters of Appleby, a law firm, and from another offshore services firm in Singapore. The leaks, too, were obtained by Süddeutsche Zeitung and ICIJ, and were shared with a network of more than 380 journalists in 67 countries including OCCRP and its Ukrainian partner, Slidstvo.info. The records show that on June 17, 2014 – ten days after Poroshenko’s inauguration – Vadim Medvedev, a lawyer working for Avellum in Ukraine, emailed Sean Dowling, an Appleby managing partner in the Isle of Man office, on behalf of the president. In other words, Poroshenko’s Avellum lawyer was telling Appleby that they wanted to set up a holding company in the BVI or on the Isle of Man to receive dividends from the whole operation. It would sit atop a chain of companies that led from Roshen through multiple jurisdictions. The plan was designed to provide Roshen with efficient access to the international market at the lowest possible tax rate. The holding company would own a Cyprus company for tax purposes, as Cyprus typically has the near-lowest corporate tax rate in Europe. The Cypriot company would own a Luxembourg company that would give the business access to international markets. The Luxembourg company would own a Netherlands-based company, which itself would own a Kyiv-based company that would hold shares of the Ukrainian companies that actually make the products. “The UBO [ultimate beneficial owner] will not hide himself – he will continue to publicly own the business until it is sold,” the letter said. The discussion did not continue any further in the leaked correspondence. But a set of previous emails between top Appleby managers explained why. From Appleby’s BVI branch, Andrew Willins asked his colleagues whether the firm would agree to provide corporate services to companies controlled by Ukraine’s new president. Robert Woods, Director of Compliance for Appleby’s Cayman Islands branch, replied that they needed more information to understand all of the risks. “With today’s headlines being ‘Ukraine’s President Petro Poroshenko has vowed to retaliate after pro-Russia separatists shot down a military plane in the east, killing 49,’ you can immediately see the inherent reputational risk of being involved with him as who knows what that retaliation will be! Anyway, the short answer is that in my opinion it is quite unlikely that this would be worth the risk involved, but without much more information and investigation there is no definitive answer,” Woods said in an email. Two months later, in August 2014, Poroshenko’s lawyers followed through with most of the plans they had outlined to Appleby, using instead the Panamanian company Mossack Fonseca, which did not express the same concerns about working with the president. The corporate structure Mossack Fonseca set up is almost identical to what Poroshenko’s lawyers had described to Appleby, with two differences: no Luxembourg company was involved and Poroshenko held shares in the holding company personally. This is the structure that would be revealed when Mossack Fonseca’s documents were leaked in the Panama Papers more than a year later. Poroshenko’s lawyers denied that the scheme carries any tax benefits for the president. According to Avellum’s written response to OCCRP, the decision not to involve a Luxembourg company was made in order to avoid reducing the amount of taxes payable in Ukraine. “Such a situation would be contrary not only to the interests of the client, but also to the state interests of Ukraine,” the letter said. After the Panama Papers revelations in early April 2016 , Poroshenko announced with great fanfare the start of a “de-offshorization” process in Ukraine aimed at bringing the country’s assets home. To that end, he signed a decree “On measures to counteract a reduction of the tax base and moving profits abroad” that created a working group assigned to prepare the corresponding draft laws by June 10, 2016. Since then, the draft legislation has not yet been submitted to parliament for consideration. Pavlo Khodakovsky, a partner at Arzinger, a Ukrainian law firm, thinks it will take two to three years before the changes to Ukrainian legislation will have an impact. “It is probably one of the biggest problems that businesses, due to an unstable and not very favorable situation [in Ukraine], try to protect themselves and save money abroad and don’t invest in sufficient amounts in Ukraine either,” he said. According to Poroshenko’s presidential decree, Ukraine would join the Automatic Exchange of Information (AEOI), an international system of sharing tax information. 49 countries have already joined the initiative, with another 53 pledging to join next year. The exchange is viewed as a powerful tool to prevent tax evasion. But, despite Poroshenko’s promise, Ukraine still hasn’t joined this initiative, though it says it will do so in 2020. Bogdan Borovyk, from the law firm Borovyk and Partners, analyzed the email Avellum sent to Appleby on Poroshenko’s behalf. “This structure is needed for selling – in order to optimize the income from selling,” he said. He noted that the president’s lawyers wrote about the “tax purposes” of the Cyprus company in this structure and explained the role of every company. “The Dutch company is the owner of the Ukrainian companies, to defend them (the business) from possible attacks by the state organs or corporate raiding. It is owned by companies in Cyprus and BVI are needed for tax optimization. They can avoid taxes when there is some kind of profit.,” said Borovyk. Profit can be generated by paying dividends or if these companies are sold. He also said that, in order for the structure to work, the companies would have to open bank accounts – though according to Poroshenko, they never did. In response to reporters’ inquiries, Medvedev, the Avellum lawyer who had written Appleby on Poroshenko’s behalf, said he would speak with his boss and promised to call back, but never did. The issue of bank accounts is a sensitive one. Poroshenko has been adamant that the Dutch, Cypriot and BVI companies he owns have no bank accounts. In May 2016, OCCRP published a report indicating that nearly €4 million had been moved out of Ukraine to a Poroshenko company in Cyprus in a combination of cash and in-kind payments. The transaction, made on March 25, 2016 by Prime Assets Capital, a Ukrainian fund owned by Poroshenko, was for the purchase of 18,000 shares of his Cyprus-registered company, CEE Confectionary Investments Limited, at €218 per share – far above the share’s face value of €1. There are few reasons to change the share price between two related companies unless someone wants to legally move assets between them. The transaction had a total value of €3,926,160. In response to OCCRP’s report, Poroshenko’s advisors accused reporters of misinterpreting and even mistranslating the form, denying that cash had been part of the transaction. According to them, the entry “cash/in kind” in the paperwork meant that either form of payment could have been used. They insisted that, in fact, only shares (an “in kind” payment) were sent. The distinction is technical but important. A cash payment would indicate that the Cyprus company had a bank account, which Poroshenko and his lawyers have repeatedly denied. Under Ukrainian rules, Poroshenko would have had to declare any such bank accounts; he did not. Poroshenko’s income declaration for 2016 lists only one foreign bank account – $1.06 million at Swiss Rothschild Bank AG. Payment in cash would also likely be in violation of the National Bank’s currency control regulations then in force. The National Bank had imposed a limit of $50,000 per month on the movement of assets out of Ukraine. In order to make such a transfer, Poroshenko would have needed a special license, which he did not have at the time. An “in-kind” payment would carry no such implications. George Ioannou, Poroshenko’s Cyprus lawyer at Dr. K. Chrysostomides & Co., said the firm would have no comment for this story, citing confidentiality and client privilege rules. One lawyer who talked to OCCRP discovered what it means to get on the wrong side of the president’s supporters. But a number of Cyprus lawyers and registry officials asked by OCCRP to interpret the transaction said the documents Poroshenko’s lawyers filed with the registry were unequivocal: The paperwork for the payment of almost €4 million clearly shows that it contained both cash and in-kind forms of payment. 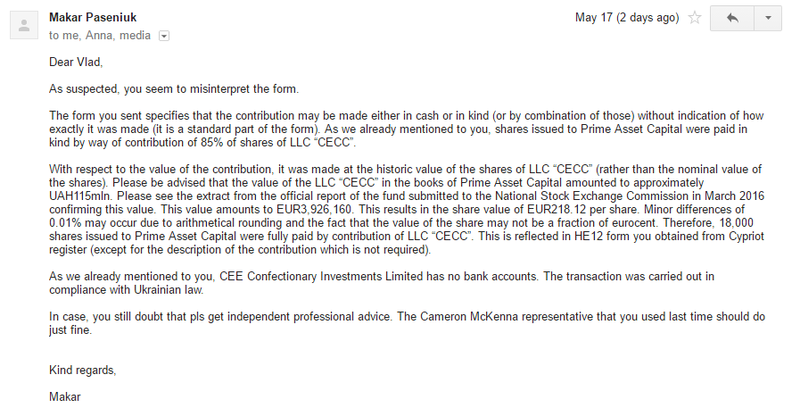 CEE Confectionary Investments is required to file annual returns which would definitely prove the issue one way or another. But when OCCRP reporters contacted the registry to request the accounts, they were told that, as of September 4, 2017, Poroshenko’s company hasn’t filed a single annual return or financial statement since its establishment in 2014. Andriy Gerus, a financial specialist, said that since the transaction was between two related companies, it likely meant that the Cyprus company needed the money for its activities. A March 3, 2016 order banned foreign investment transfers even for those holding the necessary licenses. But in May, when OCCRP asked the National Bank whether it issued Poroshenko’s Prime Assets Capital a license for foreign investment, the bank violated the law on public information access by not responding to the request. It took the intervention of Yehor Sobolev, the head of the parliament’s anti-corruption committee, to get the National Bank to respond. On June 1, he asked whether a license had been issued to Poroshenko’s companies. The financial regulator finally answered three weeks later that no such license had been issued to Poroshenko’s fund in March of 2016. The bank also said that the transaction involved no cash transfers out of Ukraine and that there were no legal grounds for providing this information to OCCRP. Roshen was Ukraine’s 90th biggest taxpayer during the first six months of 2017, according to the official top-100 list. It is one of several companies on the list which did not publish how much it paid in taxes. There is no public information about its financial operations and no indications that Roshen is being managed by Rothschild Trust. “Petro Poroshenko does not take part in the managing process of Roshen Corporation. He also does not have any information about the composition of the corporation‘s management, the management or any managerial decisions made by the trustee (Rothschild Bank),” the Presidential Administration said in response to an OCCRP request. However, the records for Roshen Europe B.V, the umbrella company in the Netherlands, still show Sergii Zaitsev, Poroshenko’s acquaintance and long-time top manager, as the company’s director. The record says that Zaitsev is “jointly authorized” with another director, a Dutch-born Albertus van Beek, who was appointed in April, 2017. The Swiss Rothschild Trust AG became a shareholder of Poroshenko’s Cyprus company on April 27, 2016, according to the local registry, nearly a month after OCCRP’s first Panama Papers investigation was published. This contradicts both Poroshenko’s and Rothschild Trust’s claims that the blind trust had been in place since January 2016. No trust agreement between Poroshenko and Rothchild has ever been published, so it’s unclear how much power Poroshenko still wields in Roshen, in which jurisdiction his Prime Asset Capital Trust is registered, where it pays taxes, or how serious a conflict of interest it may be. During a June 2016 press conference, the month after OCCRP’s earlier report, Poroshenko spoke quite a bit about his offshores. He cited a May 31 memorandum, commissioned by his advisors and issued by the Ukrainian office of the international law firm Baker & McKenzie, which detailed its own analysis of the Ukraine-Cyprus transaction. In the document, Baker & McKenzie lawyers said that none of the transactions cited in OCCRP’s report involved transfers of cash out of Ukraine, but rather were an exchange of shares between Poroshenko’s Cypriot and Ukrainian companies. The memorandum misidentifies Poroshenko’s Ukrainian investment fund as “Prime Asset Management” rather than Prime Assets Capital. It does not identify which documents had been used in conducting the analysis or reaching its conclusion. OCCRP’s request to Poroshenko’s lawyers to provide them was left unanswered. The memorandum was signed by Serhiy Piontkovsky and Olyana Gordiyenko, partners at Baker & McKenzie’s Kyiv office. In September, three months after the document’s release, Poroshenko appointed Gordiyenko as a member to the National Securities and Stock Market Commission, though she resigned in March.